San Diego - BNSF Railway Co. and the City of San Diego should pay $5 million to the parents of a sailor who died after potholes near allegedly unsafe railway tracks caused him to fly off his motorcycle into oncoming traffic, an attorney told a California state court jury on Wednesday. Jamie Scott Powell died in 2014 at the age of 23 of injuries he sustained from the accident that occurred where Harbor Drive, a city-owned street, intersects with BNSF tracks. Rebecca Blain Morrison of the Blain Morrison Law Corporation told jurors during her opening statement that the City of San Diego received numerous complaints going as far back as 2003 that depressions in the road around the area where Harbor Drive meets the BNSF tracks were causing dangerous conditions. “In addition to these general complaints about the condition of the road, the city also received specific complaints that the road was creating hazards for particular kinds of vehicles, specifically motorcycles,” Morrison said, according to a Courtroom View Network webcast of the trial. 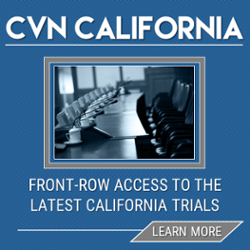 The full trial is being webcast live and recorded gavel-to-gavel by CVN. Morrison argued that BNSF also bears responsibility for the crash, due to gaps in the tracks known as phalanges. She claimed that BNSF’s safety procedures state that phalanges should be between three and four inches wide, but that deterioration of rubber filling material caused gaps as large as seven inches on the the part of the tracks where Powell was ejected from his motorcycle. Both the City of San Diego and BNSF deny any responsibility for the accident. City attorney Jane Boardman told the jury during her opening statement that analysis by accident reconstruction experts will show that Powell was speeding at the time of the accident, and that he’d customized his motorcycle in a way that made it less stable. BNSF’s attorney Anthony Sonnett of Lewis Brisbois told the jury that the tracks in question were subject to yearly inspections from state and federal agencies, and that no unsafe conditions had ever been reported. He argued that with the exception of the current case no accident of any kind had ever been blamed on the condition of these tracks. He also explained that the deterioration of rubber filling is common, and that the actual phalanges themselves complied with BNSF’s safety requirements. “It’s not considered and has never been reported as a dangerous condition,” Sonnett said. The trial before Judge John Meyer is expected to take eight days to complete, and the full proceedings will be webcast and recorded by CVN. The plaintiffs are represented by Rebecca Blain Morrison of the Blain Morrison Law Corporation and by Ian Fusselman of Thornses Bartolotta McGuire.